The Appalachian Trail is a 2,179 mile long footpath that passes through fourteen states, going from Springer Mountain in Georgia to Mt. Katahdin in Maine. Every year many hundreds of hikers attempt to walk the entire distance in a single season, but only some succeed. 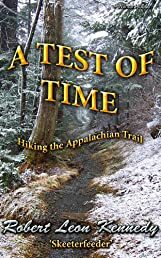 I started my thru-hike the first day of March, surprisingly caught on Springer Mountain by a dangerous winter storm that dropped temperatures into the single digits; and that was before I had even stepped foot on the world famous trail. This is the story of my adventure.